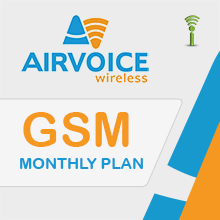 Take advantage of Airvoice monthly plan with montly voice minutes and texting. Roaming: ON AirVoice Wireless Network ONLY! Other Network Roaming NOT Available. Customers are UNABLE to dial 411, International calls, or to numbers beginning with 877, 866, 800, or 888 (except for our customer service #). Customers are also UNABLE to forward calls, initiate 3- way calls, or send/receive premium SMS. You may add an additional refill card to your account at anytime to receive more voice minutes or SMS. The refill card will add an additional 30 Days of Service to your original expiration date. You can keep track of your account status at any time! Dial *777# and SEND from your wireless handset to receive an instant account notification, informing you of your expiration date. To help keep you updated, you will receive an automated recording 3 days before your expiration date reminding you to refill your account. This message will be played on your first outgoing call of the day for the last 3 days of service. Airvoice recommends you add a refill card before your account expires to avoid service interruption. If you cannot make your payment before the expiration date, your account will cancel 30 days after it expires. If your account cancels due to nonpayment, you may lose your wireless number and may need to purchase a new SIM. Please contact Airvoice customer service at (888) 944-2355 to inquire about reinstating your account. Go to https://www.airvoicewireless.com/PINRefill.aspx. You may also call 611 from your mobile phone or 1-888-944-2355 from a landline for assistance on loading your monthly plan refill PIN. - For technical assistance, please call 1-888-944-2355.